Lean Labeling: What is it? Lean Labeling is a breakthrough concept only available at Labeltronix. We help our customers order high-quality labels so they can make quick changes based on their needs, while reducing their overall label costs. At Labeltronix, we don't encourage customers to order more. We want them to get just what they need, when they need it - and we're the only company with the technology and technique to make Lean Labeling happen. Lean Labeling: How can it help you? 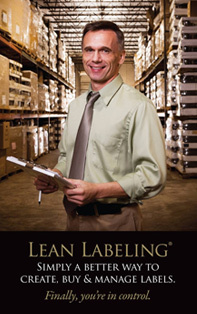 Lean Labeling Program: Are you a good candidate? 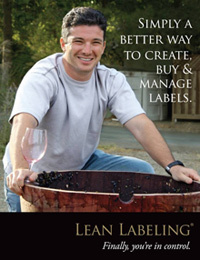 Who do I contact to get a free “Lean Labeling Assessment” for my company? How is Labeltronix able to offer Lean Labeling? Reduce your label cost by getting a "fixed price" regardless of your order size. We don't make you order more than you need to get a great price. You get a great price anyway! Increase your flexibility by changing information on your labels as often as you like. Increase your sales and speed to market by getting high-quality labels in days instead of weeks. Reduce label costs by inexpensively ordering samples or prototype labels. Do you have more than a few product lines, SKU’s, or part numbers? Does the information on your labels change? Do you introduce new products frequently? Are you interested in new ideas for reducing your overall labeling cost while increasing your flexibility? If you answered "yes" to any of these lean labeling questions, please contact us to see how we can meet your labeling needs. Labeltronix built a state-of-the-art plant in Anaheim, CA that uses the very latest in both digital and flexographic printing technologies. We also incorporated valuable customer feedback for the innovative thinking and processes that allow us to give our customer top-notch lean labeling service. Since 1993, Labeltronix has delivered the promise of quality and reliability in every customer solution it creates for consumer product manufacturers of food, wine, nutritional supplements, cosmetics, automotive, and personal care products. Labeltronix is a leading provider of flexo labels, labeling systems and supplies, service and technical support. It has become the single-source labeling supplier for all of its customers - its labeling experts don't simply follow the trends; they set them.